Keyed to the workbook level and page, the flashcards feature a word or conjunction clue with the answer and page number on the back. These flashcards are printed on thin cardstock, and are the same as the pages (on normal paper) that are in the back of each workbook. Cut and hole-punched, a ring and plastic storage bag are included. 148 cards. This workbook features the exercises to help your students learn Latin. Plenty of vocabulary review and practice exercises help children to memorize vocabulary and use it correctly. Coloring, matching, and fill-in-the-blank exercises are included, as well as a set of flashcards to cut out in the back. Lessons cover the accusative case, first person singular & plural, Genetive case plural first and second declensions, third person, nomitive case, and more. 180 pages plus flashcards, spiralbound, softcover. 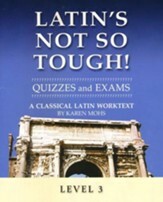 This set of quizzes and exams accompanies Greek'n'Stuff's Latin's Not So Tough Level 3 Worktext. Four quizzes, a comprehensive midterm and a comprehensive final are included. Translation exercises, vocabulary identification, and some simple conjugations are included. Answers provided in the back; parents are supposed to cut out the tests. 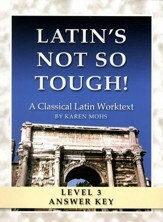 This worktext answer key accompanies Greek'n'Stuff's Latin's Not So Tough Level 3 Workbook. An overview of the lessons provides tips and hints for teachers before moving into the answer key. Just like the workbook, pages are arranged by type of exercise, not by complete lesson. Answers are overlaid on full-size reproductions of the student pages. 180 pages, spiral-bound, softcover. 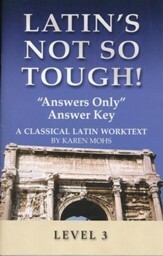 This short "Answers Only" key is a small booklet that provides the sold-separately Latin's Not So Tough, Level 3 Student Workbook. line-listed answers for each page. Paperback. Level 3. 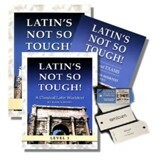 Practice your Latin whenever you have a spare moment, whether you're at home or on the go. Keyed to the workbook level and page, these Level 3 flashcards feature a word or conjugation clue with the answer and page number on the back. These flashcards are printed on thin cardstock, and are the same as the pages (on normal paper) that are in the back of each workbook. Cut and hole punched, a ring and plastic storage bag are included. 148 cards, each approximately 4.25" x 2." 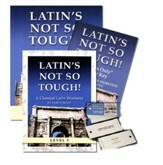 Ensure you're correctly pronouncing the Latin words you're learning! 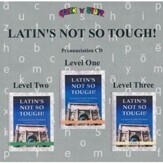 This audio CD accompanies Latin's Not So Tough's Level 1, 2, and 3 curriculum sets. Tracks cover the pronunciation of Latin letters, diphthongs and special consonants, new vocabulary, and paradigms. Indexed to workbook level and page. 1 CD.